First, why did he put R3 high--alone: H-Bridge Transistor Smoking? My real question is about the minimum number of parts. I believe the minimum components for a BJT H-Bridge applied to a small 3-6V motor, controlled by an Arduino, are four of each: transistors, diodes and resistors. Edit: Since this question has been downvoted, I recede the BJT constraint. Can it be done with less components? I found many poor designs with less parts. For example, this one and this one are missing flyback diodes among other things. 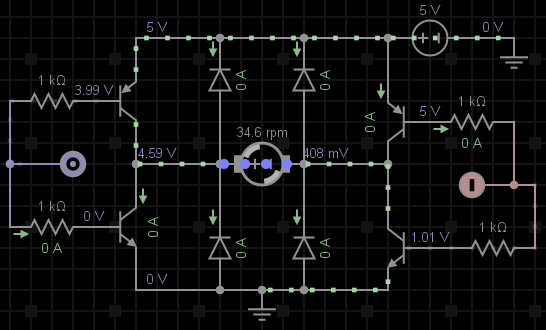 This circuit allows you to do forward, reverse, and brake-stop (short motor out). C1 may be required to keep flyback pulses safe for the transistors. It cannot do PWM motor control, and you can't turn all the transistors off while the motor is running. Both of those require the flyback diodes. For a small reversing motor it is the simplest circuit. For PWM you have to add the diodes. Because any drop across the MCU's output fets supplying base current is a direct loss of motor voltage, you want transistors with the best HFE at the motor current, and an MCU with good output drive. Ganging up multiple port pins can improve the drive. The problem with simple bipolar motor drives where port pins directly drive a single transistor, is that in traditional bipolars the HFE drops off as the current increases, at the same time as the port pin vrop is increasing. So it works well at low currents, but quite abruptly hits a current where it doesn't really work any more. There are modern bipolars that have much higher reliable gains, and push this workable range up - especially for the high side transistors where the port pins often have significantly weaker pull up drive than pull down drive. Also note that older bipolars BC547,BC337 have high gain grades BC547C, BC337-40 which you should be using for this. It would cost more than just making the simple H-bridge, but less than merely buying an L293 H-bridge chip (which I guess does not need resistors). $1.40 for four of everything--unless my question's ckt is bad--which it is. Finally, sweatshop labor being $0.00... Facetiousness aside, that's what it comes down to for hobby electronics. *This price comparison is only for controlling one motor. Two motors can be driven off one chip. This project uses the SN754410NE. Another project used L2930. Not the answer you're looking for? Browse other questions tagged arduino dc-motor motor-controller dpdt or ask your own question. Is it possible to control a DC motor with Microstepping driver? Lowest denominator components to drive salvaged DC motor with 9v battery and Arduino? Can I control a 12V motor from arduino using an H-bridge?